Caracas (AFP) - Venezuela's self-proclaimed acting president Juan Guaido said Monday he was taking control of the country's foreign assets as he piled pressure on leader Nicolas Maduro by calling for a new wave of protests against the embattled regime. Guaido, the opposition leader who has declared himself the country's ruler amid violent anti-government protests, says "usurper" Maduro's rule is illegitimate and wants to set up a transitional government ahead of new elections. In a statement published on social media, he said he was "beginning to take progressive and orderly control of our republic's assets abroad to prevent, during his exit... that the usurper and his band try to empty the coffers." 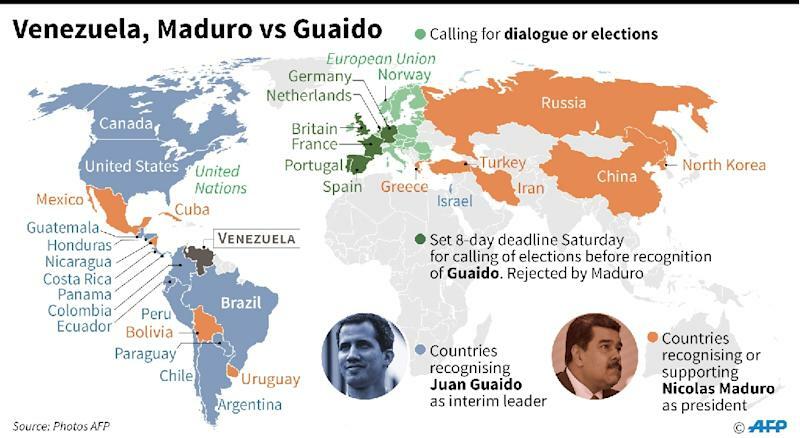 Guaido also called for a two-hour strike Wednesday "to demand that the armed forces side with the people," ahead of a "big national and international rally" on Saturday to acknowledge support from several European countries that have issued Maduro a deadline to hold new polls. Pope Francis said Monday following a trip to Panama that he was afraid the escalating political crisis in Venezuela would descend into "a bloodbath." The White House meanwhile urged Venezuela's military to accept a "peaceful, democratic and constitutional transfer of power." National Security Advisor John Bolton told reporters in Washington President Donald Trump was leaving "all options... on the table" when it came to considering getting the US military involved in the crisis. Maduro, 56, has so far refused to budge, telling Turkish television station CNN Turk: "No one can give us an ultimatum." Millions of Venezuelans have been left in poverty or fled the country due to an economic crisis, marked by hyperinflation and shortages of basic necessities, which began in 2014. Maduro devalued the currency by 35 percent on Monday, aligning it with the exchange rate for the dollar on the black market, but analysts said it would only "make things worse." Guaido, the 35-year-old head of the opposition-controlled National Assembly, says the election Maduro won in May wasn't fair as it was boycotted by the opposition, while many in the international community branded it a fraud. Last Wednesday Guaido launched a power struggle with Maduro by declaring himself "acting president." He has the been recognized as Venezuela's interim president by the United States and a dozen Latin American countries while Britain, France, Germany, Portugal, Spain and the Netherlands said they would follow suit unless Maduro calls elections by February 3. The EU has so far held back from joining the ultimatum, saying it would take "further actions" if elections were not called in the coming days, including the issue of recognition of the country's "leadership." Russia, China, Turkey and leftist regional allies Cuba, Bolivia and Mexico continue to back Maduro. On Monday, the president of the Inter-American Court of Human Rights, Eduardo Ferrer, called for the leaders of both sides to meet "through peaceful channels" to find a way to "rebuild institutional democracy and full respect of human rights." Venezuela Foreign Minister Jorge Arreaza said Mexico and Uruguay are to present offers to host talks on solving the political crisis to the United Nations. Canada said it would host an "urgent meeting" of the Lima Group of 13 Latin American nations plus Canada on February 4 to "discuss the steps we can take to support Juan Guaido and the people of Venezuela." That came as Rafael Uzcategui, director of the Venezuelan Program for Education-Action in Human Rights, accused the FAES police special forces unit of carrying out eight unlawful executions following last week's protests, which he said had proved more deadly than previously thought. "We have the corroborated figure, with first name, surname, place and presumed guilty parties, of 35 people murdered in the context of the protests" since Monday last week, said Uzcategui. Another NGO, Foro Penal, said 850 people, among them 77 children, have been arrested. 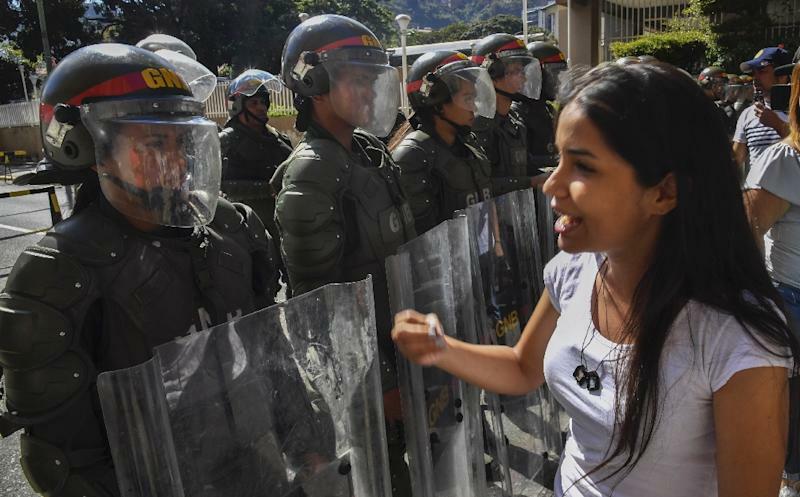 The US has warned there will be a "significant response" if US diplomats, Guaido or the opposition-controlled National Assembly are targeted with violence and intimidation. Encouraged by the international support for his cause, Guaido is on a mission to weaken the military's support of Maduro, which has been essential to keeping him in power since 2013. His appeals have included promises of amnesty, and mass protests against Maduro, who has presided over the collapse of the economy and a severe humanitarian crisis, with shortages of food and medicine. Venezuela Defense Minister Vladimir Padrino on Monday dismissed the amnesty offer as a "deception" and an "instrument of manipulation," insisting that "no-one in the armed forces believes it." 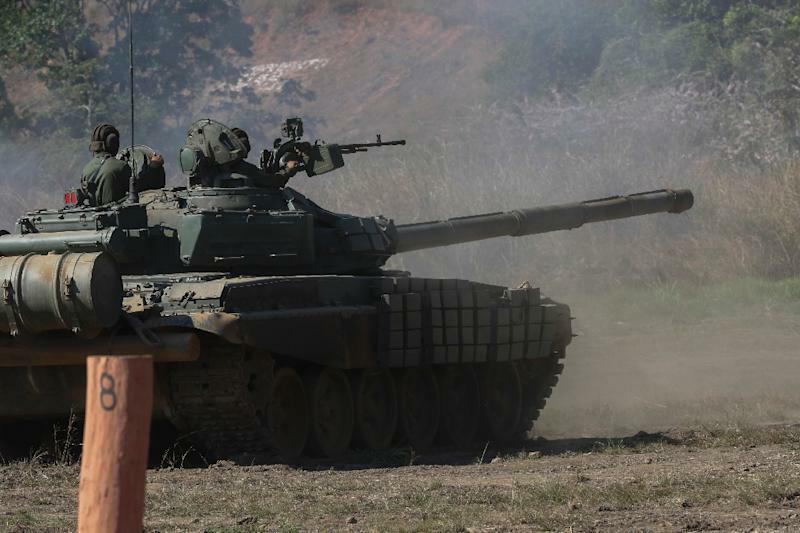 So far, the military has backed the leftist regime, which was ushered into power 20 years ago by the late Hugo Chavez, a former military officer. But Venezuela's military attache in Washington, Army Colonel Jose Luis Silva, switched his support to Guaido while Washington also accepted exiled opposition leader Carlos Vecchio as Venezuela's new charge d'affaires to the United States. Scarlet Salazar, a Venezuelan consular officer in Miami, said Monday she was also throwing her support behind Guaido in a videotaped statement.